This comes about by people claiming authorship of their own pages and linking them to their Google Plus accounts. There are lots of reasons why people are doing this and why you should consider doing it too. People tend to respond better to articles written by real people rather than a faceless organisation. If people see a smiling photo next to your page in the search results, they’re more likely to click through and read your work. If people like your articles and click through to read them, they will become better placed in Google search results. Agent Rank, or Author Rank, is a the name for a mechanism by which search engines prioritise articles for a particular author based on how popular their other articles are. This is still in its early days and people are debating whether this has a significant result on search results yet. But Google holds patents around the area and it’s positioned to have a more significant effect in determining search engine results in the future. In addition to Author Rank, claiming ownership of your work helps Google to establish the original author. This means that Google can prioritise your webpage or blog post over ones that have copied or plagiarised your unique content. Google uses your Google Plus profile as your identity (https://plus.google.com/). The first stage is to indicate on your Google Plus profile which websites you publish on. The second stage is to indicate the author on your webpage. Google now has verification from both sides and can make the association between your article and you as the author. Via email address. If you have an email address on the domain you are publishing on, such as stefan at senktec.com, when publishing on the domain senktec.com, you can associate that with your Google Plus profile (https://plus.google.com/authorship). You must then ensure all your articles contain a “by” line with your name, such as “By Stefan Senk”. In theory, most authors should have access to at least one of these methods. Google seems to be pushing option 1, the email address route, but I generally prefer option 3, as it doesn’t pollute the page content with any text that may not be desirable, and you don’t need to have an email address for the domain the articles are published. It’s also quite easy for content management systems, such as WordPress, to implement option 3 by allowing you to add a Google Plus URL to your profile and automatically adding the <link> tag to all the pages you are author of. So, you’ve set up a Google Plus profile, you’ve linked to your website, you’ve submitted email addresses, you’ve got your name on your articles, and you’ve got loads of links to your Google Plus page all over your articles. You want to know any if any of it is working. 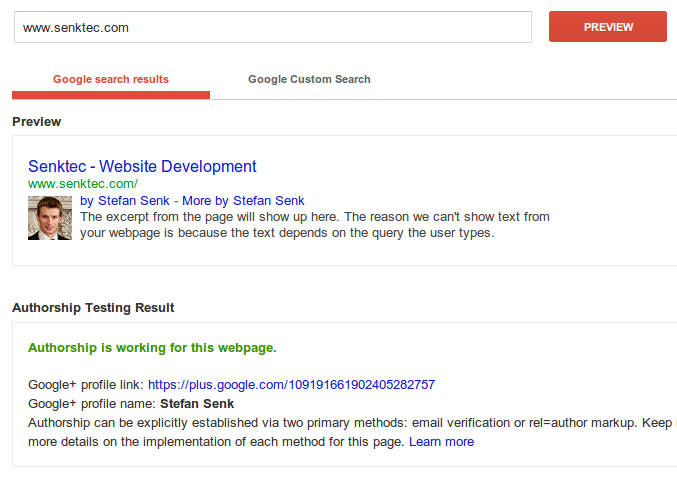 Google has a useful tool called the “Structured Data Testing Tool” which tells you just that. You can find it at http://www.google.com/webmasters/tools/richsnippets. Submit the URL of your page and, if it’s working, you should see a preview of what it will look like in Google search results, and reassuringly, green text telling you that “authorship is working”. Now everything is technically correct, so you just have to wait for Google to decide it wants to show you as the author in its search results. People are typically reporting that it takes somewhere between 24 hours and 2 months for them to start appearing as the author in Google’s search results. Google search results for AntarcticGlaciers.org started showing the author as “WAI Sheet”, but nobody by that name had ever written any content for the website. It seems possible that the name came from “West Antarctic Ice Sheet“, which is a string of text appearing on several pages. Within 24 hours, the author “WAI Sheet” had gone from the search results. However, the pages were now showing without any author instead of the new author. There has been reports from people that it had taken 2 months to start appearing so we just waited for Google to decide it wanted to show the author. After 2 months we started to suspect something may be up. Technically it was correct as the validator was still passing it and it was showing the author in some certain cases, such as for the back-link checker (e.g. https://www.google.com/search?q=link:antarcticglaciers.org) but normal search results still came back with no author. At this point we tried 2 things. We added the author’s name to be displayed on the normal pages as well as the blog articles (previously, the author’s name was only on the blog articles). Neither has been showing the author in the Google search results. Secondly the author changed her Google Plus profile picture to a more recognisable head shot. The previous photo was a head shot of the author wearing sunglasses, a buff and a hat whilst on fieldwork in Antarctica, and the photograph was probably not recognisable as a face by face detection software. 2 weeks after these changes the author started to be shown in the search results. It says clearly in Google’s instructions that the Google Plus profile photo should be a recognisable head shot, but unlike the structured mark-up testing tool, there’s no way to know if Google thinks your photo isn’t appropriate, or why they’re not actually showing you as author in search results. Many other people have posted similar issues with photos, but it could have just taken Google a while to get round to approving her photograph, or a combination of those factors and possibly expanding her Google Plus profile and Google Circles network, meaning that Google thinks displaying her as an author is useful for people searching. Posted on 13/06/2013 by Stefan Senk. Posted in General, Tech. Tagged html, wordpress.